Looking for a simple, functional weekend DIY project for your home? Consider creating a custom homework corner for your children. 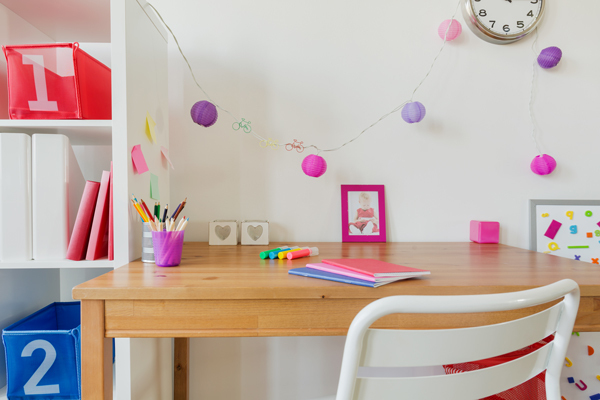 Creating a dedicated space in your home for the kids to study can increase productivity, clear up paper clutter and provide an unexpected boost in style. The best place for a child to do homework is in their room, with the door closed…right? In theory your child’s room is the best place for them to work – but the distractions can be seemingly endless. Toys and music, television, books and more can sidetrack your little ones from completing their assignments. Creating a dedicated space for your children to focus can make all the difference. Not only can you clear up homework clutter in their rooms, you’re also giving them a place to call their own – empowering them and renewing their motivation to succeed. Bonus: when they ask for your help, you can work on projects together in a common space – never worrying about invading the privacy of their bedroom. Workspace: Select a good sized desk or table that’s large enough to accommodate standard homework notebooks and papers, as well as larger projects such as science fair displays. Chair: For those long study sessions and complicated projects, picking a comfortable, yet supportive chair is essential. Outlet: Your child will need to plug in a lamp, computer, and be able to charge a mobile phone or tablet device. With 2 ports for USB charging, as well as 2 outlets for standard plug-ins Leviton’s Duplex USB Charger/Tamper Resistant Outlet is a perfect choice to accommodate a variety of devices in one convenient outlet. Surge Protector: If one outlet just isn’t enough, Leviton’s Surge Protection Devices can offer additional plug-ins for your child, while protecting their sensitive electrical equipment. It’s simply a must-have for electrical safety. Lamp: Use a desk or floor type lamp with an adjustable neck to focus light where it’s needed. Useful for projects that have small pieces or require crafting. Bookshelf: Dedicate a space to your child’s growing library of books, supplies, and tools. When designing your child’s space, include them in the process from start to finish by allowing them to pick a new lamp, chair, or supply box. Giving them the freedom to personalize their space can help them feel independent, and doing it together will create a special memory you can both share.